Bernd Pennewitz in one of those rare individuals who lives between the worlds of the young and the old. As a child, Pennewitz enjoyed Wiking toy cars, but it was his previous experience with building models for trade fairs and marketing projects that paved the way for this side project to become a business. Pennewitz's creations fascinate fans of all ages. Building off his own interest in model cars, he was soon tinkering on his own miniature version of James Dean's 550 Spyder to accent the driveway of his daughters' dollhouse. The ornate replica had its own folding trunk, tiny instruments, and an electric motor. Though Pennewitz hadn't planned on dedicating much time to this new weekend endeavor, the reaction to his first immaculate Spyder spurred him on to produce a few more. The quality of these electrically-driven miniatures convinced an initially skeptic Porsche to hand over a coveted licensing agreement, which requested he make two within the course of three weeks to prove his commitment. The obvious standards Pennewitz held himself to came across as soon as he brought his two models to Stuttgart, and any doubts quickly faded. “I didn’t even have to unload the second model from my car,” he told Christophorus—and like that, a complete series was greenlighted. 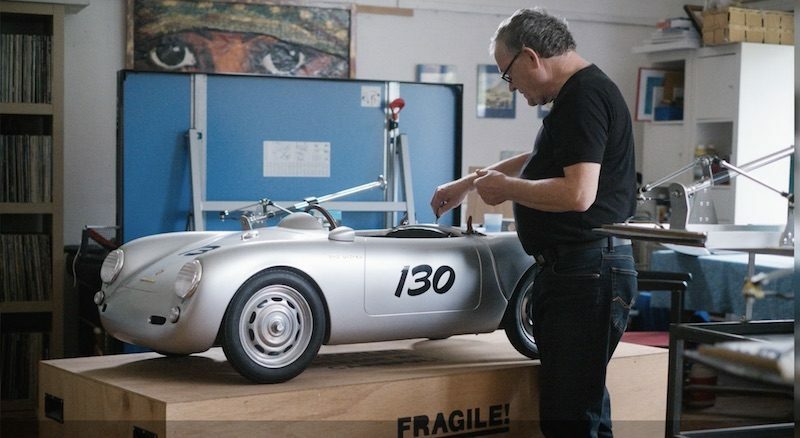 Pennewitz builds these scale model Porsche replicas in his 120-year-old farmhouse. They're painstakingly detailed pieces of rolling art that can reach 20 to 45 km/h. Though the original 550 Spyder replica was made with foam, chainsaw and guesstimation, the current scale Porsches are computer modeled and laser-milled from steel and aluminum. Painting the plastic components is one of the more challenging aspects of the build process, one which is outsourced, as is sourcing of the turn signals and wheels. Some of the more obscure items, like headlight covers, have to be hand-molded by Pennewitz. Pennewitz has produced over 150 scale Porsche replicas which appeal to enthusiasts both young and old—hence why he has no problem charging roughly €10,000 for each. The electrically-powered scale Porsche models come in a variety of shapes, including the legendary 904 GTS, and reach 20 to 45 to km/h depending on the specification. He intends to embark on an ambitious new chapter—replicating a 911—but that requires he finds a sponsor. However, considering the fanfare his models have commanded, he shouldn't have much difficulty doing just that.